Over forty Sisters of Mercy from Latin America and the Caribbean gathered in Belize from the 20 – 26 July for the XII Latin American Caribbean Conference of Sisters of Mercy. Countries represented included Honduras, Guatemala, Jamaica, Belize, Guyana, Argentina, Chile and Peru. (Two Sisters from Brazil were unable to attend due to last minute visa complications at the airport). Also present were members of Institute leadership teams from the Americas, Newfoundland, Great Britain, Ireland, New Zealand and Australia. 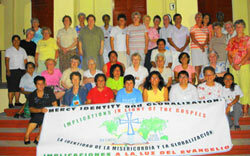 The conference was a real experience of Mercy International with Sisters of Mercy from fourteen countries. The theme of the Conference was “Mercy Identity and Globalization: Implications in Light of the Gospels.” After the opening Mass, during which the flags of the fourteen countries represented featured in the entrance procession, there were country presentations showing the effects of globalization on the people living in each country. Many common themes emerged: poverty and extreme poverty, rising food and petrol prices, exploitation by multinationals, unjust trade agreements, high levels of unemployment and underemployment, lack of adequate education, health services, social services and basic services such as clean running water, environmental damage… The gathering was further enriched by the presence of several Associates and local Belizeans who told their stories of Globalization from the perspective of their lived reality. The comment was made at one point that while the ideal in many affluent countries is for each school age child to have their own computer many children in Latin America and the Caribbean do not receive adequate food each day… One of the most powerful sessions was an address by Senator Godwin Hulse from Belize who spoke about Globalization from the political / business perspective. He spoke very poignantly of his experience of going alone to represent Belize (a very small poor country) at an international trade meeting and feeling totally powerless when having to negotiate with the USA who arrived with a contingent of a 100 people which included experts on every aspect of the topic. Guest speaker James Nickoloff from USA, who has studied Liberation Theology with Gustavo Gutierrez, also assisted with the process of helping the Sisters look at how they might respond to the effects of Globalization on those in their ministries. He said there was need for a new consciousness to create something new that restores the dignity of the human person who very often feels totally insignificant in the face of Globalization. Education was seen to be a key factor in awakening the people more to the reality of what is happening in each of their countries and how they might challenge / resist the negative effects of Globalization. The future of the LACC Conference was also discussed and it was decided to hold the next conference in Peru in 2012. In light of Sisters and their Associates working to combat global problems such as poverty and unjust trade agreements the LACC Conference was seen as an important forum to create networks to work internationally and for strengthening Mercy International. The Globalization of MERCY comes through SOLIDARITY with the POOR!